When Katie Psutka was a teenager, she loved watching CSI and thought working in a lab might be cool. Now she has earned Wilfrid Laurier University’s first doctorate in Biological and Chemical Sciences. Psutka has been at Laurier her entire academic career. She chose it for its intimate atmosphere and also in part so she could stay in her hometown of Kitchener and keep teaching Irish dance on the side. In her first year, she wasn’t sure what area of science she wanted to specialize in. Then she met Associate Professor Ken Maly. Maly, who is now acting dean of the Faculty of Science as well as an active teacher and researcher, was Psutka’s first-year chemistry professor. She loved his teaching style and found the liquid crystals he researched pretty and fascinating. She started working in his lab right after her first year. She ended up staying for a decade, earning a BSc and MSc in chemistry – not to mention a long list of scholarships –along the way. When she became one of the first students in the brand-new PhD program in September 2014, it didn’t feel especially risky, says Psutka. Not only could she keep doing work she loved with a mentor she liked and respected, she was keen on the interdisciplinary opportunities the program offered. The program started because there was already quite a bit of collaboration between biology and chemistry faculty members at Laurier, says Maly. Psutka’s research focused on chemistry, but biology was also a strong interest for her – she did a minor in it for her BSc. During her doctoral studies, she enjoyed learning more about biology through departmental seminars and a graduate class that considered scientific issues from both biological and chemical perspectives. “I feel like it’s made me more well-rounded and has given me more appreciation for the research other people are doing,” says Psutka. Though we generally think of matter as existing in a solid, liquid or gas state, liquid crystals are somewhere between a liquid and a solid. They can flow like liquids but their molecules are arranged in a crystalline structure. Psutka works with organic materials that produce disc-shaped crystals and are good at transmitting electrical charges. One focus of Psutka’s work is preparing materials that are liquid crystalline at room temperature. Psutka works with organic materials rather than the silicon used in current electronic devices because silicon is a rather expensive, non-renewable resource. Specifically, Psutka works with polycyclic aromatic hydrocarbons (PAHs) based on benzene. 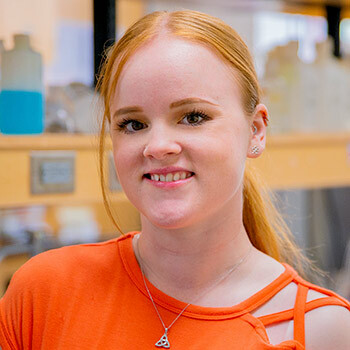 Although PAHs do occur naturally in the environment, she builds her own in the lab using a sequence of chemical reactions, then replaces the oxygen in the molecules with sulphur – a process called thionation – and observes how that changes them. Future researchers might be able to use her novel findings to improve the charge-transport ability of materials that can be used in devices such as solar cells and light-emitting diodes (LEDs), says Psutka, who has already published one paper in a peer-reviewed journal and is working on a second with Maly. Maly is excited to see Psutka graduate. Over the years, he has seen her grow into a skilled experimental chemist who is diligent, well organized and a strong communicator, he says. There should be more students defending their theses this summer and fall, and since a number of faculty members have the capacity to accept more PhD students, Maly expects the program to grow from last fall’s enrolment of 14. As for Psutka, she’s not quite sure yet what her future holds personally. She successfully defended her thesis in July and is now almost finished with revisions. She will continue working in Maly’s lab until the end of the summer as she applies for jobs. While she would love to stay in academia – she loves teaching as well as research – she would also consider a career in industry.